HTC's new 6-inch phone takes everything we loved about the U11 and augments it with a more up-to-date design, the latest Android software, and a huge battery. It's become something of a sad cliche to preface an HTC review with a refresher of the company's current monetary woes, contrasting what have generally been quality products with what has generally been a grim financial performance. Sure, HTC as a company has indeed seen better days, but it still knows how to make great Android phones, as evidenced by the quality of devices like the U11. Now, as the year draws to a close, there's a new model on the horizon — at least for some of us. The HTC U11+ boasts a larger, taller screen, a souped-up battery, and Android Oreo out of the box. 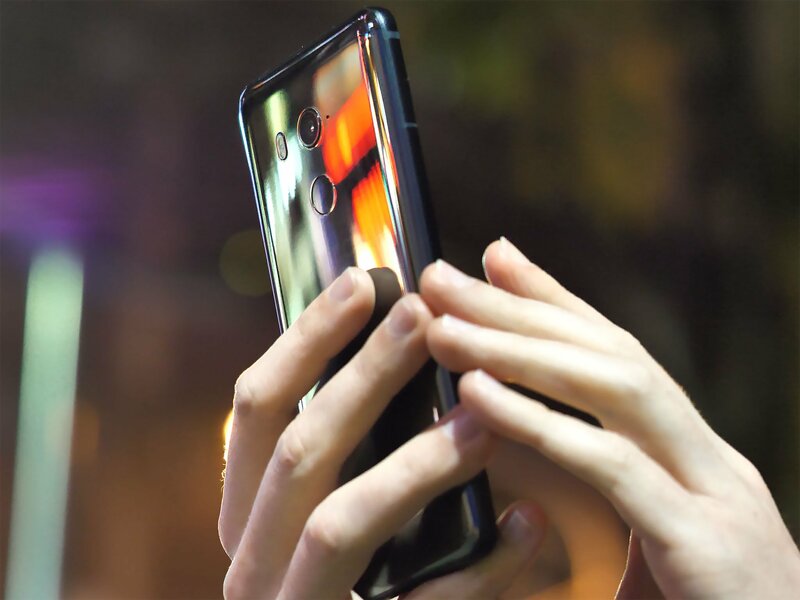 The U11+ won't be launching in the United States, possibly due to lack of carrier interest, possibly thanks to the woeful performance of the U Ultra just nine months ago. In the UK, it's being sold only through HTC's website, with none of the major networks or high street retailers picking up the device. And it's a shame to see such a limited release, because this is a really good phone — perhaps the most competitive HTC handset since the days of the M7 and M8. We're publishing this review after twelve days with an unlocked Asia-model HTC U11+ (2Q4D100). I (Alex Dobie) used the U11+ primarily in Taipei, Taiwan in dual-SIM mode, with a Taiwan Mobile SIM and an EE (UK) SIM roaming on Chunghwa Telecom. I also used it in single-SIM mode (with the TWM SIM only) for two days during this time, in order to judge any performance or battery life differences without the second SIM. The phone was running software version 1.05.709.12, based on Android 8.0 Oreo, with the October 1, 2017 Android security patch. For the HTC faithful, the most notable change in the U11+ is its move to a taller aspect ratio, and with it, a welcome reduction in screen bezels. With its latest flagship, HTC finally joins the 18:9 club, with a display more in keeping with current flagship trends. 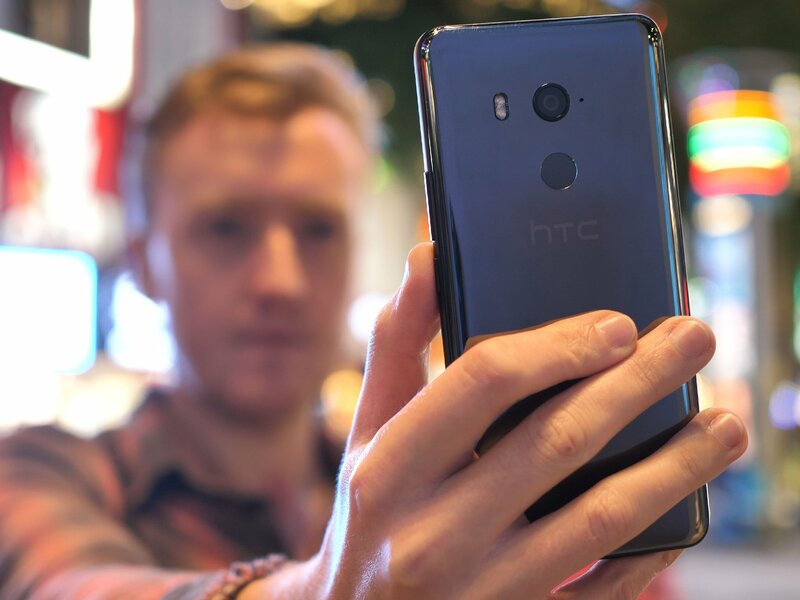 The front face of the device isn't exactly bezelless — there's still both a forehead and chin to be seen here — but the borders have been trimmed down significantly from older HTC offerings, like the decidedly bezelly (non-Plus) U11. Accordingly, from the front, it no longer looks anywhere near as dated as its forerunners. Were it actually being sold in carrier stores in the West, it wouldn't look entirely out of place alongside a Galaxy S8 or Pixel 2 XL. 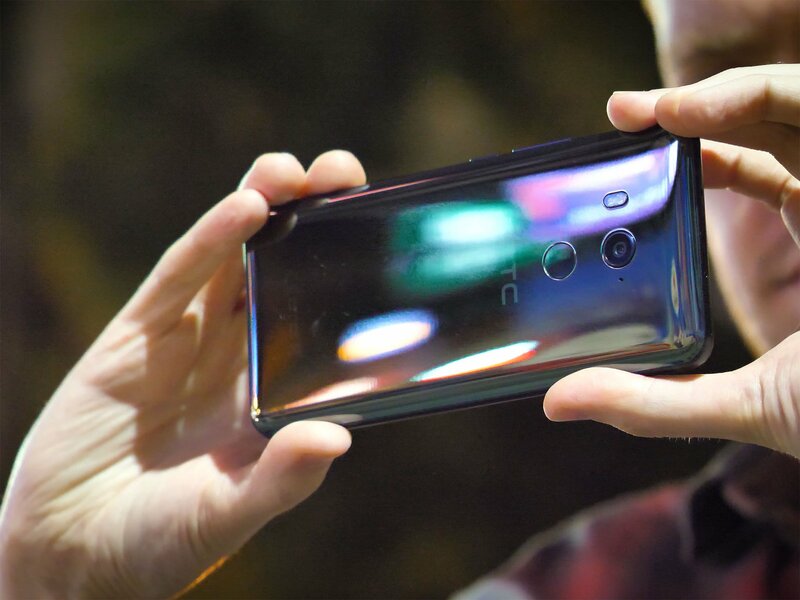 Of course, this is still an HTC U phone, and fittingly there's a gorgeous "liquid surface" curved glass panel around the back of the U11+, which is every bit as eye-catching as the other models in this series. This isn't just any old Gorilla Glass 5 panel — HTC uses multiple layers of the substance to give the rear of the U11+ a unique shimmer. I've been using the black version, which has more of a reflective gunmetal finish than the pitch black you might find around the back of a Samsung phone. There's also a blue model, which is more or less identical to the blue U11, and really unique translucent color option that won't be on sale in Europe until 2018. HTC finally joins the 18:9 club. HTC has changed more than just the dimensions in its latest phone. 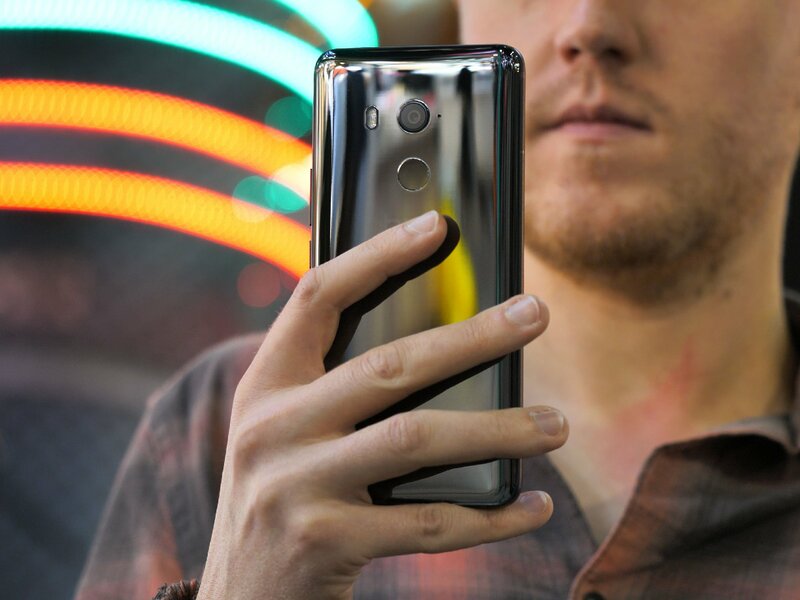 There are redesigned brushed aluminum side walls too, which are reminiscent of the old HTC 10, and as a result more angular, and a little easier to hold onto. Despite these design tweaks, this is still a supremely slippery phone. Between the 6-inch display diagonal and the very slick finish of the glass back, you may well want to take advantage of the protective case bundled in the box. And like all glass-backed phones, hairline scratches on the rear of the U11+ are basically an inevitability if you go without any sort of protection. 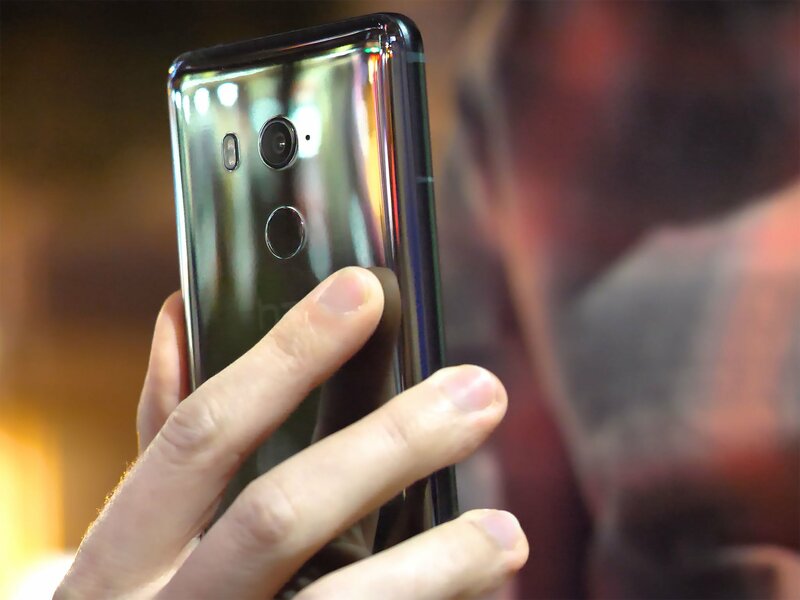 Incidentally, the taller screen means the fingerprint scanner now lives around the back of the phone, just below the single rear camera, and HTC has also reintroduced on-screen keys to its Android UI. For me, both are welcome changes. There's a fair amount of heft to the U11+, in terms of both size and weight, but I don't really mind that. The phone feels solid and well-made, and a little more grown-up than the regular U11, which was trying a little too hard to be curvy. Unlike just about every other HTC phone, these extra-large proportions are filled out by an extra-large battery. Personally, I'm absolutely fine carrying a less svelte handset if it means I also get a gigantic battery. The extra heft of the U11+ is filled out by an extra-large battery. The front of the U11+ is featureless except for the earpiece, and a 6-inch SuperLCD 6 display at 2880x1440 resolution. (SuperLCD, like SuperAMOLED, is largely a meaningless marketing term; the "6" just signifies that HTC feels this screen is a generation above that of the regular U11's SuperLCD 5.) These 6-inch, 18:9 panels are increasingly becoming the new normal — the industry seems to be settling on this size as the new go-to standard for larger Android phones, and that's great. It works well on the U11+ just like it does on the Pixel 2 or LG V30 — though with significantly more heft than the LG phone. The panel itself is attractive, if not spectacular. It lacks the awesome daylight visibility of the Samsung Galaxy Note 8, and the punch of OLED in general, but on the whole, it looks good — there are no glaring issues here. The panel is tuned to DCI-P3 by default, but you can monkey with colors in the settings, including tweaking white balance and switching to sRGB mode for more accurate color reproduction. Under the hood, HTC takes the core specs of the U11+ and layers on a few key upgrades, which means this is another rock-solid Android phone running Qualcomm's proven Snapdragon 835 platform. In the UK, 6GB of RAM and 128GB of storage is the standard loadout — in some other places, like Taiwan, there's a 4GB-plus-64GB version as well. (As mentioned above, I've been using the 6+128 version.) The battery jumps to a whopping 3,930mAh, putting it in the same league as the Huawei Mate 10, at least in terms of the numbers. (More on that later.) And the water resistance spec steps up to IP68 from the U11's IP67. Other specs are unchanged — Snapdragon 835, microSD expandability and Quick Charge 3, but no wireless charging. There's still no headphone jack to be found, which I hate having to deal with in every phone that omits it. But alongside the standard 3.5mm dongle, HTC does include its pretty great USonic noise-canceling earbuds in the box, which impressively dampen background noise whether you're walking down the street, on a busy train carriage, or dealing with turbulence on a long-haul flight. Compared to some manufacturers, I at least feel like there's a decent trade-off for HTC's omission of the increasingly rare 3.5mm jack. When you're not using earbuds, a U11-style BoomSound Hi-Fi setup, combining the earpiece speaker and a bottom firing woofer, provides about the very best on-device playback outside of the few phones that offer front-facing speakers. Audio quality is about on par with the U11 — reasonably loud, but sometimes lacking in bass. That's fine overall, though perhaps slightly disappointing for some — I do feel like there's probably room for front speakers in this design, particularly given the size of the top and bottom bezels. 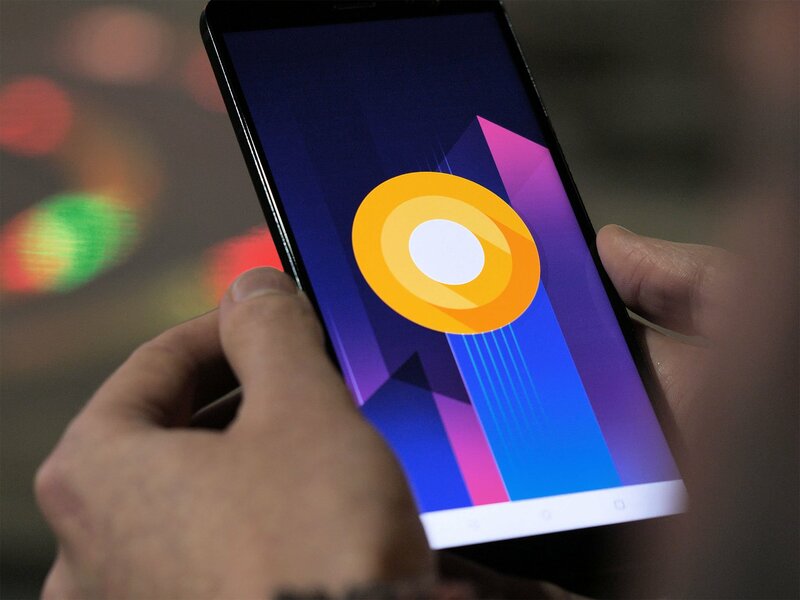 New phones shipping with Oreo are still relatively few and far between, so it's great to see the HTC U11+ arriving with Android 8.0 out of the box. HTC's Sense customisations are still around too, and look mostly the same as on the U11 — as Android "skins" go, this remains a relatively light touch, with most of the underlying design direction appearing to have come from Google. HTC's UI combines mostly stock Oreo with one or two differentiating software tricks. These few changes don't do much to alleviate the general staleness of Sense, however. 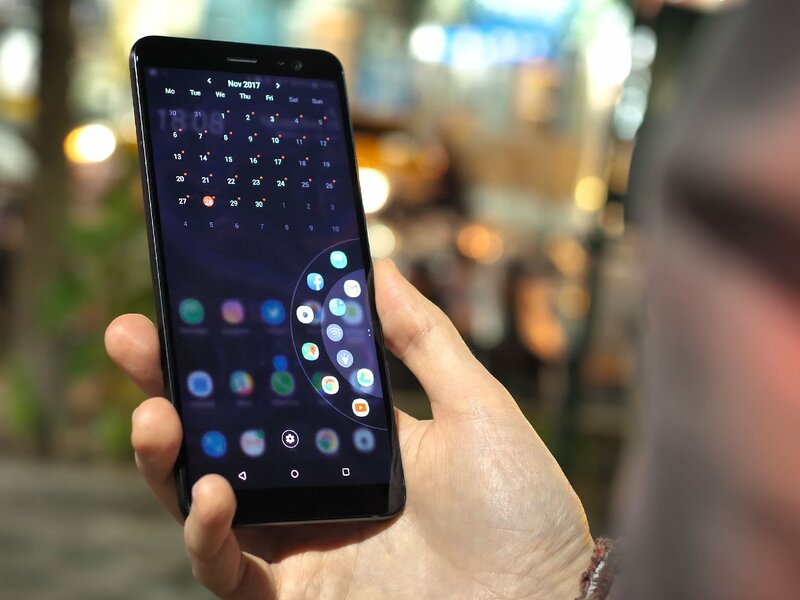 Many Sense apps haven't changed in years, whether it's the Dialer and Messages apps unchanged from the 2015's One M9, or the weather animations that date all the way back to 2011's Sensation. The combination of Sense-plus-Oreo looks fine and is perfectly pleasant to use, with pastel colors, light accents, and clean lines. But this is far from the overhaul that I think HTC's UI really needs. HTC has at least built out its squeezy 'Edge Sense' capabilities — the function introduced in the U11, which lets you perform certain actions by squeezing the sides of the phone. More actions in specific apps are now supported, including Google Calendar, Facebook, Instagram and Google Photos. And there's also a way to map specific functions of other apps to a squeeze as well, through a kind of recording function, which tells Android to simulate a tap in a certain area when you squeeze in a particular app. This feels a little clumsy, particularly because it creates complications when you're in landscape mode, but overall it works well enough. The new Edge Launcher feature is another Edge Sense addition. Similar to Samsung's Edge Panels, it gives you a couple of wheels of shortcuts, alongside a quick calendar view. Wheels of shortcuts — either apps or quick settings — can be realigned to either edge, accommodating both right-handed users and lefties. More than nine months on, HTC Sense Companion still isn't anywhere near useful. At the same time, Sense Companion, which was useless on the U Ultra and useless on the U11, is just as much of a waste of space on the U11+. HTC's on-device AI thing didn't show me a single useful piece of information in a week or so of use. And any utility it might offer is undone by occasional crazy suggestions, like telling me to wake up early for a co-worker's doctor's appointment on another continent, or telling me tomorrow's weather in my home country while I'm traveling overseas. It's tripped up way too often by travel, or shared Google calendars, and should either be given the engineering work it sorely needs, or be scrapped entirely. HTC's software still has the fundamentals down, though. It's insanely fast — every bit as performant as Google's Pixel phones — and doesn't add too much cruft on top of stock Android. To me, that speed and clarity are worth the one or two superfluous features that I can easily disable. HTC Boost+, the company's dubious performance-boosting app, now appears to come with adds enabled by default on the U11+. Not great. HTC's touch response continues to rank among the best on any Android phone. The hacked Google Pixel 2 HDR+ camera app works great on the U11+, about matching the performance of Google's handsets in the challenging situations where it shows. ... But of course as we'll get to later, HTC's own camera app also does a fantastic job on this phone. The U11+ boasts the kind of battery capacity which basically guarantees you solid longevity. And in its latest phone, HTC takes advantage of an almost 4,000mAh cell ensure a full day between charges, even with heavy use. The only time I needed an evening re-charge was in dual-SIM mode, using the phone continually for YouTube streaming over LTE, occasional music playback and social networking, and a few hours of 4G tethering. With lighter use, you'll manage a day and a half with ease. This isn't really a two-day phone, though. I still feel like Huawei's Mate 10 Pro gets slightly more mileage from a similar sized battery, possibly due to software tuning, or its use of a lower-res OLED display. I should also point out that I noticed higher than average standby power draw in dual-SIM mode — noticeably more than with other Snapdragon 835 phones. It's possible this was due to the quirks of roaming on a UK SIM on a Taiwanese network. Using the phone in single-SIM mode, with just a Taiwan Mobile SIM installed, produced standby times more in line with dual-SIM contemporaries like the Huawei Mate 10 Pro and OnePlus 5T. Unsurprisingly, it's really hard to kill off the U11+'s almost 4,000mAh cell in under a day. When I was really pushing the U11+ in dual-SIM mode, I'd get between 18 and 19 hours per charge, with screen-on times between four and seven hours. As always, it depends on what you're doing. In any case, if you're caught short, HTC still offers both regular and extreme power-saving modes, the former of which saved my bacon on one occasion, while out recording video after a long day of general use. When it's time to recharge, the bundled Quick Charge 3 brick will quickly bring you out of the danger zone if you forget to charge overnight, and the phone also supports quick charging over USB-PD. Charging speeds aren't quite up to the level of OnePlus's Dash Charge or Huawei's SuperCharge, but you'll still be able to pull enough power to see you through the day in the time it takes to take a shower and eat a quick breakfast. The U11+'s main camera packs the exact same hardware found on the standard model — a 12-megapixel Sony sensor with 1.4-micron pixels, and optical stabilization, behind an f/1.7 lens. And like the regular U11, the Plus leans heavily on HTC's HDR Boost technology, which helps it capture more color detail in night shots, and gather more dynamic range from most scenes in general. This is basically, HTC's answer to Google's HDR+ cameras. Fittingly, HTC's HDR Boost-equipped camera the closest I've seen another manufacturer come to matching the HDR+ features of the Pixel 2. Google is still unchallenged when it comes to noise reduction and extreme low-light photography, thanks to that computational edge. (Google's Panorama mode is also infinitely superior to HTC's, for what that's worth.) Nevertheless, the U11+ is a very close competitor, and for my money, it's essentially a coin toss between the U11+ and the Huawei Mate 10 for the number-two spot. Basically, this is the U11's camera with slightly upgraded software. As a particular point of strength, HTC's camera is superb at pulling lots of color out of night scenes, and pulling more dynamic range out of challenging light in general. And unlike the early days of the U11, the camera no longer tends towards over-exposing darker scenes quite so much. HDR Boost also seems a little quicker than I remember it being on the U11, possibly thanks to software enhancement, or the extra couple gigs of RAM compared to the 4GB U11 I was using earlier in the year. In every other way, this setup is identical to the camera of the U11. 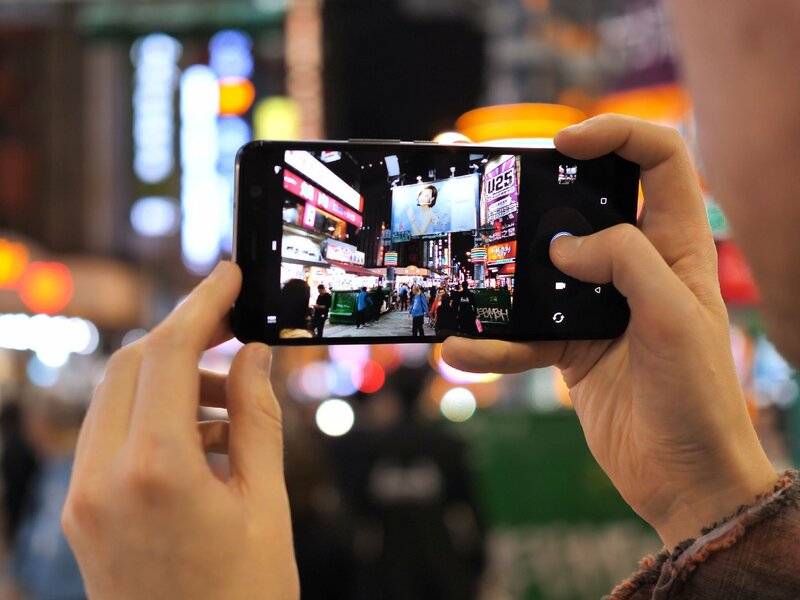 The main thing you don't get here that many competing phones do offer is portrait mode, which may or may not be a big deal for you. Personally, I can live without it. But in the coming year, expect this to become a table-stakes feature for all high-end phone cameras. Around the front, an 8-megapixel camera and f/2.0 lens aims to up the U11+'s selfie game, particularly in darker conditions. I've found the results closely match the very similar setup used in the Google Pixel 2, though obviously without that phone's front-facing portrait mode option. Once again, in selfie mode, the U11+'s squeezy shutter shortcut comes into play, allowing for easier captures when contorting your thumb towards the on-screen controls isn't an option. The U11+ is almost certainly the flagship HTC should've released six months ago. This phone looks more modern than the regular U11 — and with a bigger battery, higher specs, a sharper design and more fleshed-out Edge Sense options it's way more competitive in the market in general. 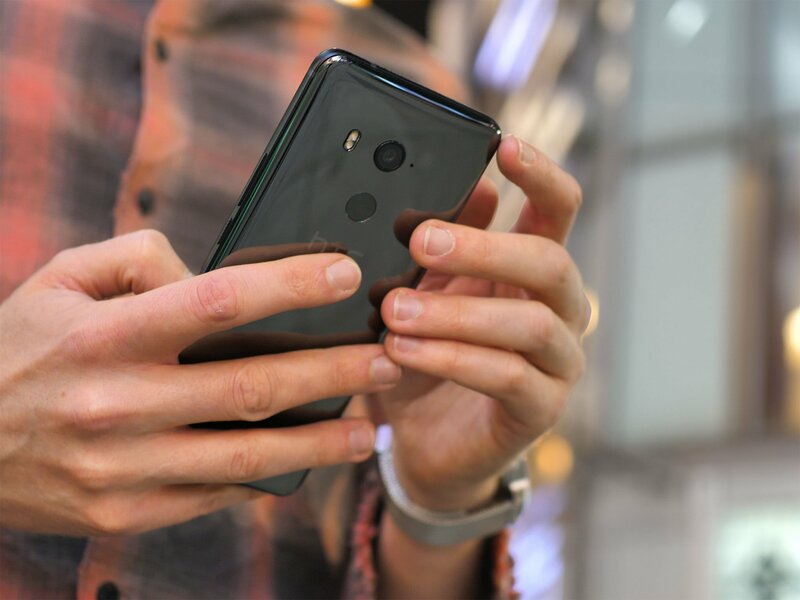 In the UK, its 699-pound price point — or 629 if you can find it on sale — makes it comfortably more affordable than the Pixel 2 XL, and a genuine competitor to the more widely-ranged Huawei Mate 10 Pro. The worst thing you can say about the U11+ is that it's yet another excellent phone in a year overflowing with great new Android handsets. It's tough to stand out, and the U11+'s true differentiating features — battery life, software quality and day-to-day performance — don't make for an easy sell. This is the phone HTC should've released six months ago. Nevertheless, the U11+ makes the strongest case yet for HTC's continued presence in the smartphone market. For the first time in a while, I feel like HTC kinda has its mojo back — at least on the product side. Availability is another question altogether, though. If you're in the UK, the only place to buy a U11+ is direct from HTC, and in the U.S., there are no launch plans at all. For that reason, it's unlikely this phone will do much to move the needle for the company. But assuming you can buy it, the U11+ is a top-notch Oreo-powered flagship with solid construction, a beautiful glass design whether you go mirrored or translucent, and differentiation through clean software, a fantastic camera and dependable battery life. It might not be as exciting as a Note 8 or a Pixel 2 XL, but it's just as worthy of your attention, and your money.